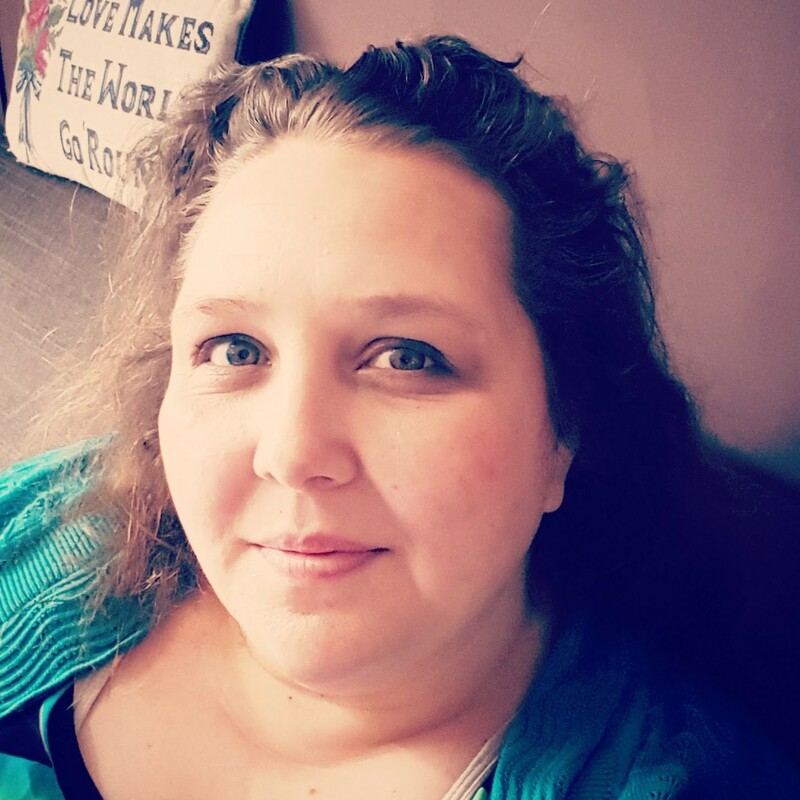 Unlike the lovely Jen, we don't have a no tech after 6pm policy in our house. We do however have Family Home Evening, where we have an evening at home as a family... it's one of those self explanatory titles isn't it? It's actually something that is positively encouraged by the leaders of my Church and so whilst we have a religious element to ours we always end up playing a game or having an activity and so I thought that I'd share them with you over the year, just in case you're looking for something fun to do with your family of an evening. 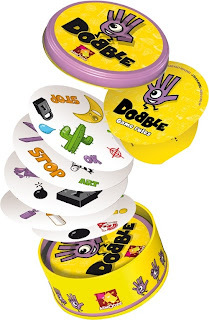 Recently we were sent Dobble by Esdevium Games, (you can buy the game in Waterstones and in most Toy Shops too) as they were sure that it was something that our family would love to play on Family Games Night and they were right. 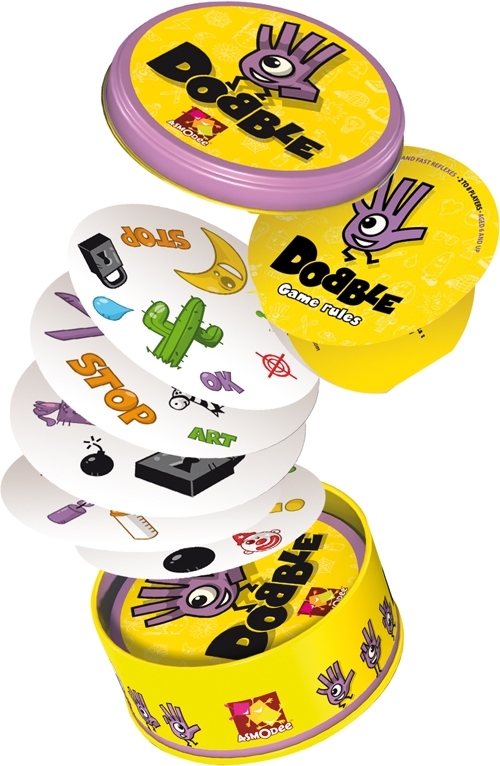 Dobble is designed to be played by 2-8 players aged 6+, although Big Boy at 5 played it and understood what to do rather well. The game comes with instructions that are easy to understand although out of the mini games that it explains how to play our favourite is the third, which is a version of Snap. We had great fun playing the game, sitting on the living room floor together and we ended up playing for a lot longer than we had intended to and bedtime slid to roughly an hour later than we as parents would have liked, but it didn't matter. The children were in such a good mood from the game playing that they quite happily went to bed and have played Dobble again themselves and more importantly without arguing about it! The game is all contained in a little tin, so little that it's easy to put in my handbag to keep us amused if we have a spare ten minutes when we're out and about this Summer and it's small enough to throw in the floor of the car (our Citroen Xsara Picasso has hidey holes for things like this) to keep us amused when we're out and about. The game has an RRP of £12.99 and as I mentioned it's available from Waterstones and most Toy Shops. 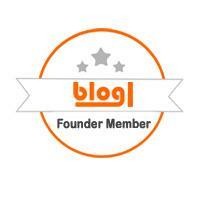 We were sent Dobble to review, it's surprisingly addictive.